Born in 1753 at Castleton, County Cork, Ireland, Richard John Uniacke enjoyed the wealthy life of the landed gentry. At 16, Uniacke was articled to a Dublin attorney, and his career path was set. However, after a quarrel with his father, he fled Ireland at age 20 and arrived in Philadelphia in 1774.There he met Moses Delesdernier, a Swiss-born resident of Nova Scotia seeking settlers for lands on the Bay of Fundy. Uniacke accepted Delesdernier’s invitation to come to Nova Scotia to work for him. At age 21, Uniacke married Delesdernier’s 12-year-old daughter, Martha Maria. Late in 1776, Fort Cumberland, near present-day Amherst, was unsuccessfully attacked by a force of American Revolutionary sympathizers from Maine during the "Cumberland Rebellion." Uniacke was involved in trade in the area and was arrested on suspicion of treason. He was taken to Halifax as a prisoner, however, the charge against him was later dropped. Shortly after, Uniacke returned to Ireland to complete his legal training. He returned to Nova Scotia in 1781 and was appointed Solicitor General. The following year, Uniacke was elected to the Nova Scotia House of Assembly. Later, he became the Speaker of the House and gained a reputation for his eloquence and quick wit. His private law practice flourished and made Uniacke a wealthy man. His appointment as Advocate General in the Nova Scotia Vice-Admiralty Court increased his fortune and stature. 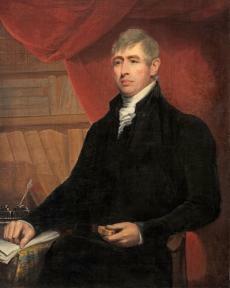 Uniacke was able to use his wealth to educate his 12 children. He also directed much of his fortune to the construction and maintenance of his home in Halifax and his country estate at Mount Uniacke. Completed by 1815, the 11,000 acre estate was a symbol of Uniacke’s success in the New World.